An asteroid collides with the prehistoric Earth, causing the extinction of the planet's dinosaurs, but sparing a tribe of cavemen living near the impact site. Finding a roughly spherical chunk of the asteroid that is too hot to touch, the cavemen begin to kick it around and invent the game of football. 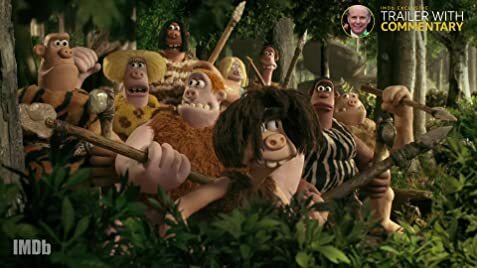 Many years later during the Stone Age, a young caveman named Dug (Eddie Redmayne) lives in the village with the chief Bobnar (Timothy Spall) and many other cavemen such as Asbo, (Johnny Vegas), Gravelle (Gina Yashere), Treebor (Richard Ayoade), Magma (Selina Griffiths), Barry (Mark Williams), Grubup (Richard Webber), Thongo (Simon Greenall) and Eemak (Simon Greenall). 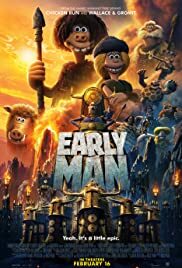 One day, Dug suggests to Bobnar that they should try hunting woolly mammoths instead of rabbits, but Bobnar brushes him off..
Aardman always put a smile on my face; it's no 'Wallace & Gromit', but few things are.